You’ve probably heard of Sicily; it’s not really a secret island. But somehow, the largest island in the Mediterranean has managed to retain its status as a hidden paradise. Seemingly overlooked in favor of more popular Italian spots like Rome or the Amalfi coast, Sicily is all but forgotten when most Americans plan their Italian getaways. But this Italian utopia has it all — except for the mass overtourism that some might argue is ruining other Italian cities like Venice or Florence. Sicily marches to the beat of its own drum, a different land with different rules, making it a very special destination to visit. If you aren’t convinced yet, here are some of the reasons you need to eat, drink and tour your way through the magical island of Sicily. Human activity on the island of Sicily dates back to 12,000 BC. Over the years, the island’s rulers include Romans, Greeks, Phoneticians, Germanic Goths, Arabs, Spanish and of course — the Italians. With seven UNESCO World Heritage sites and over 25 castles scattered around the island, the rich historical makeup of its past can be felt everywhere you explore. 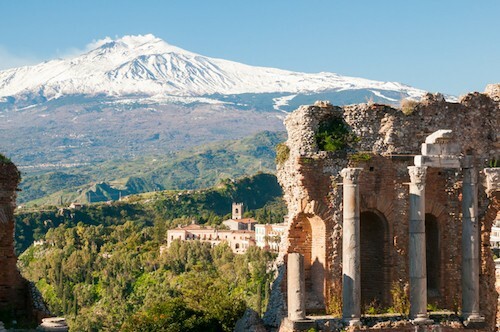 The island’s claim to fame is Mount Etna, which is the tallest active volcano in Europe. At almost 11,000 feet, the volcano towers high above the island, and often spews black ash around to stir things up. You can visit the attraction by hiking, a jeep tour, skiing, quads, biking and even do a wine tour. Yup, you heard right– volcanic ash and soil actually make for excellent wine cultivation. The Etna region even has its own Italian DOC. Cassata, caffe latte, brioche e granita al limone to start the day. It’s true — Sicilians forgo cappuccinos for breakfast and instead indulge in a specialty called granita. The sweet treat is made of frozen water, sugar and other flavors. Some of the most popular kinds have almond, lemon and strawberries as their main ingredients, all delicacies that grow locally throughout the island. You may as well go all out and order even more Sicilian desserts for breakfast, like a cannoli, which are fried dough tubes filled with creamy ricotta paste topped with pistachios or cassata, a ricotta cake with candied fruits. 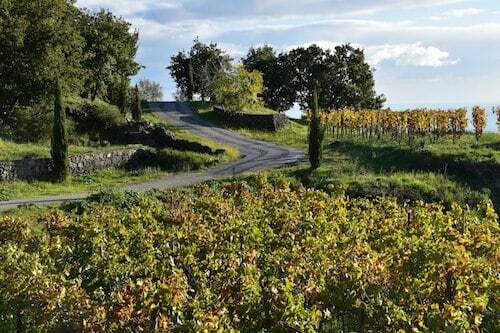 Besides the aforementioned volcanic Etna wines, Sicily has a number of different wine regions. Fan favorites typically include the famous Nero d’Avola, a strong wine with special fermentation techniques. Then there’s stronger, dessert wines like Malvasia and the fortified Marsala, which is similar to Port. Of course, washing your meal down with a few sips of Grappa never hurt anybody! 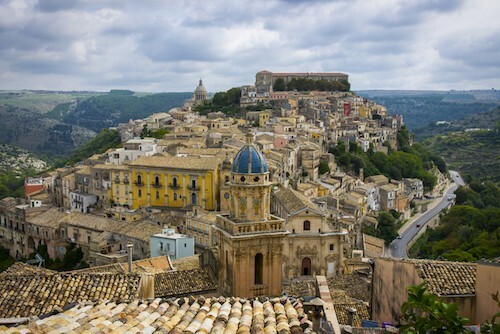 One of Sicily’s greatest appeals are the stunning Baroque hilltop towns, like Caltagirone, Modica, Noto, Ragusa and Scicli, among others. These towns are magnificent, historical spots, with homes and buildings carefully constructed into the hillsides. Each of the towns has an extensive amount of Baroque architecture and art. 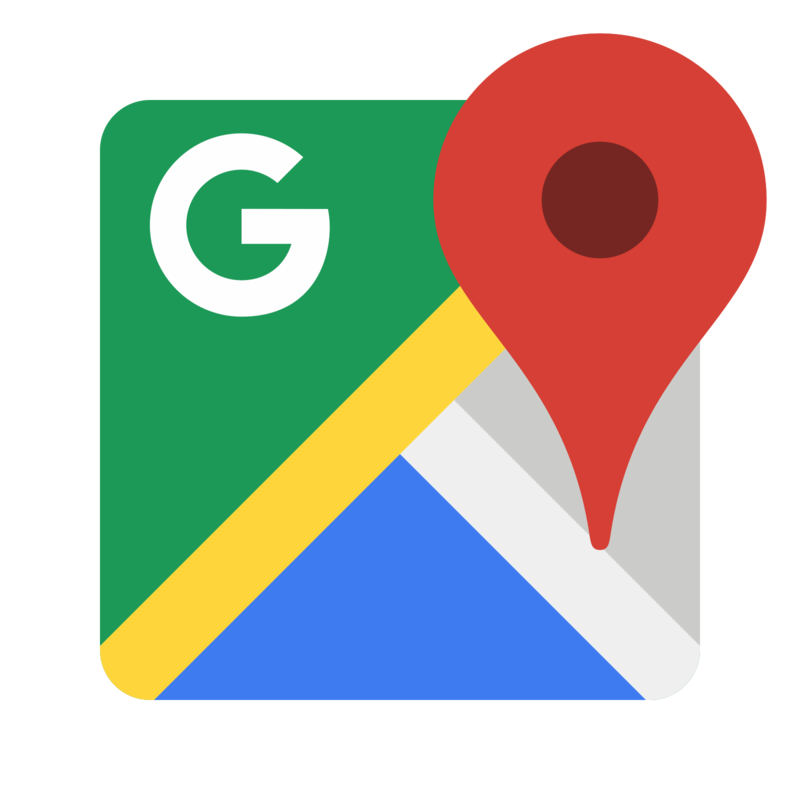 It’s best to rent a car, set a base in a spot such as Noto and explore a few villages each day. Be ready to climb! Sicily is an island, which means plenty of sandy shoreline and clear waters. 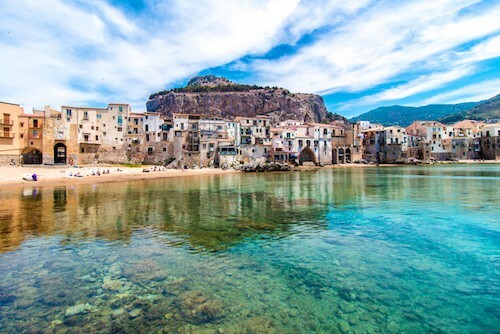 One of the most popular beaches is Cefalù, a charming little town backed by towering cliffs. Isola Bella, ‘the Pearl of the Ionian Sea’ is an easy day trip from Taormina by boat. Or, swim in the clear waters of Lampusa, one of the Pelagie Islands that’s closer to Africa than Italy. Even the rocky beaches are special in Sicily, like the Scala dei Turchi. This beach’s white rocks formed by the tides resemble a smooth staircase coming out of the water. Photo captured by Karen Lauricella at Monaci Delle Terre – a Sicilian boutique country retreat and wine estate in the foothills of Mount Etna. The island of Sicily is chock full of agriturismos, a type of farm-style B&Bs which offer homegrown culinary experiences and quaint, rural lodging. Staying at an agriturismo means you’ll dine on things locally grown on the property. In Sicily, that means meals are topped with pistachios and almonds. Expect vegetables from the garden, fresh Italian cheeses and olives. Orchards on the properties ensure you’ll savor the citrus tang of homegrown fruits like fresh lemons and oranges. You may even drink wine cultivated at your agriturismo too!